Landlord does hereby lease to Tenant and Tenant does hereby lease from Landlord that certain real property located in ____________, ____________ County, ____________, legally described as set forth in Exhibit "A" attached hereto and incorporated herein by reference, for the term, at a rental, and upon the covenants and conditions as hereinbelow set forth. 1.0 PREMISES. The premises shall consist of the land described in Exhibit "A" together with the following improvements with square footages being approximate; (a) a single story retail store building without a basement of ______ square feet with an office mezzanine of ______ square feet and a storage mezzanine of _____ square feet; (b) a single story retail drive-through building materials building, fully roofed, without a basement, of _______ square feet with a storage mezzanine of _______ square feet; (c) an enclosed retail garden sales yard of ________ square feet with ________ square feet of open area. The balance of the garden yard shall be occupied by Tenant supplied and installed __________ square feet commercial greenhouse on a steel support structure by Landlord; and related improvements to be constructed on the above described real property by Landlord, pursuant to plans and specifications as hereinafter provided (collectively the "Premises"). The Premises are depicted on the Site Plan attached hereto as Exhibit B and incorporated herein by reference. No changes shall be made thereto without Tenant's prior written consent except that the exterior stairs in the rear of the Building have been modified. Notwithstanding anything in this Lease to the contrary, Landlord is constructing a building and other improvements on the Premises. Such building and improvements shall be built substantially in accordance with plans and specifications prepared by Tenant's architect and approved by Landlord and Tenant, and such building and improvements (and written change orders thereto) shall be substantially completed on or before ____________. Tenant's General Outline Specifications and Requirements for New Buildings, dated ________, are attached hereto as Exhibit C. With respect to the improvements existing as of the Commencement Date, Tenant's architect has incorporated Tenant's interior display and fixture drawings with the final building drawings in order that all Tenant's interior and exterior work be included under the primary building permit. Exhibit C, as amended by the change orders, covers the respective construction obligations of both Landlord and Tenant, but does not specifically designate the construction obligations to be performed by each party. Each party, as its sole cost and expense, has the obligation to construct their respective portion of the improvements substantially in accordance with Exhibit C, as amended by the change orders. 2.0 IMPROVEMENTS TO BE BUILT BY THE PARTIES. Landlord, at Landlord's sole expense, applied for and obtained the necessary construction permits, commenced with the construction and erection of the improvements to be built by Landlord hereunder and shall proceed with such construction to substantial completion with reasonable dispatch. The improvements constructed by Landlord shall be substantially completed at Landlord's expense in substantial compliance with Exhibit C, as amended by the change orders on or before ____________. The improvements shall be constructed and erected in a good and workmanlike manner, and shall be adequate and serviceable in all respects for use by Tenant under this Lease. Notwithstanding anything to the contrary contained in this Lease the Premises were delivered to Tenant in a substantially complete condition on ______________. Tenant, at its sole cost and expense, shall, (i) construct the greenhouse located in the garden area, (ii) construct and install the display and fixture improvements, (iii) construct Tenant's work substantially as indicated on Exhibit C and as amended by the change orders if any. Tenant shall be responsible for any additional improvements to the building which are necessary for Tenant's tenancy and occupancy of the Premises pursuant to the provisions of this Lease. Tenant shall have the right, at its own expense, to perform any and all fixturing and other work Tenant deems necessary to prepare the store for opening, and Landlord hereby grants Tenant access to the Premises to accomplish such construction, so long as Tenant does not interfere with Landlord's construction. Landlord warrants that Landlord will obtain a certificate of occupancy from the appropriate governmental authorities having jurisdiction over the Premises (which may be a temporary certificate of occupancy, provided such certificate permits occupancy and does not prohibit the commencement and operation of Tenant's business). Landlord hereby assigns to Tenant all rights under warranties and/or bonds relating to the repair, maintenance and/or condition of the improvements to be built on the Premises, and Landlord will cooperate with Tenant in order to obtain for Tenant the benefit of all other warranties and/or bonds. Each party shall pay for the cost and expense of lien-free completion of their respective construction obligations on the Premises. Tenant, at its sole cost and expense, shall pay the architects and engineer's fees for the preparation of the plans and specifications and for the supervision of the construction. Tenant shall acquire no equity in the Premises of Landlord by reason of payments for leasehold improvements or otherwise. 3.1 Commencement Date The term of this Lease shall be for __________ years commencing on ____________ (the "Commencement Date"). 3.2 Lease Year. The first lease year, if the Commencement Date is the first day of a calendar month, shall be the twelve (12) successive calendar months that begin on the Commencement Date. If the Commencement Date is not the first day of a calendar month, the first lease year shall be the twelve (12) successive calendar months that begin on the first day of the calendar month next succeeding the Commencement Date. 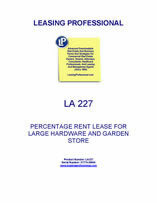 Thereafter, subsequent lease years shall be the succeeding twelve (12) calendar month periods after the first lease year. 3.3 Options to Extend. Tenant shall have two (2) consecutive five (5) year options to extend the Lease term, provided that at the time of the exercise of the option, and at all times after the exercise of the option and prior to the commencement of such extension, Tenant shall not be in default under the Lease for a default which it has failed to cure within the applicable cure period. Tenant shall notify Landlord of the exercise of its options no later than one hundred eighty (180) days prior to the expiration of the initial term of the Lease or the expiration of the first extended term, as the case may be. Minimum Rent for the option periods shall be as set forth in Sections 4.3, 4.4 and 4.5 below. Percentage Rent during the option periods shall be computed as set forth in Section 5 below. 4.1 Minimum Rent Tenant shall pay to Landlord, without offset, notice or demand, as fixed minimum rent, the monthly sums set forth below (the "Minimum Rent"), which shall be paid in advance on or before the first day of each calendar month of each lease year during the lease term. If the lease term commences on a day other than the first day of a calendar month, the Minimum Rent for such month shall be a prorated portion of the monthly Minimum Rent. The Minimum Rent shall begin on ____________ (the "Rent Commencement Date"). The Minimum Rent for each of the first five (5) years commencing on the Rent Commencement Date shall be $____________ per year payable at a rate $__________ per month. 4.2 Surcharge. Tenant acknowledges that late payment by Tenant to Landlord of the Minimum Rent, and any other sums required to be paid by Tenant to Landlord hereunder, will cause Landlord to incur costs not contemplated by this Lease, the exact amount of such costs being extremely difficult and impracticable to fix. Such costs include, without limitation, processing and accounting charges, and late charges that may be imposed on Landlord by the terms of any encumbrance and note secured by any encumbrance cover the Premises. Therefore, if any installment of Minimum Rent due from Tenant is not received by Landlord by the 5th day of each and every month, or any other sum required to be paid by Tenant to Landlord or others as provided for in this Lease is not received when due, Tenant shall pay to Landlord an additional sum of 5% of the overdue Minimum Rent as a surcharge. Failure to pay the Minimum Rent on time shall be construed to mean the failure to mail the fixed Minimum Rent to Landlord on or before the 5th day of the month with postmark affixed thereto or to deliver the Minimum Rent to the Landlord by the 5th day of the month. 4.3 Adjustments to Minimum Rent. To provide an equitable adjustment of rent to offset the effects of inflation, the Minimum Rent shall be adjusted at the end of each 5 year anniversary of the Rent Commencement Date, the adjustment to be determined by the Index (as defined below) published closest, but prior to, the first month of the first year of the Lease Term (the "Base Index") and every fifth year of the Term (the "Subsequent Index") in accordance with changes in the Consumer Price Index for all Urban Consumers for the ____________ area on the 1982 - 84 = 100 base published by the Bureau of Labor Statistics, U.S. Department of Labor (the "Index") using the procedures set forth in Section 4.4 below. If the Index is discontinued or revised during the Term, such other government index or computation with which it is replaced by the Bureau shall be used in order to obtain substantially the same result as would be obtained if the index had not been discontinued or raised, and if the Index is not so replaced, Landlord shall adopt a substitute index or substitute procedure which reasonably reflects changes in the purchasing power of the U.S. dollar. 4.6 Option Period Rental. The option period rent ("Option Period Rent") shall be determined by an adjustment over the last 5 year period of the Lease Term, or preceding option period, whichever the case may be, by using the same adjustments to Minimum Rent, as set forth in Sections 4.3 and 4.4 above, but subject to the maximum limitation set forth in Section 4.5 above. 5.1 Percentage Rent. In addition to the Minimum Rent, Tenant agrees to pay to Landlord as additional rent for each lease year, 2% of the amount of annual gross sales in excess of $___________________. Within 60 days after the end of each lease year, Tenant shall furnish to Landlord a statement of the gross sales for said lease year and the additional rent, if any, shall be payable not later than 60 days from and after the close of the lease year. Such statement shall set forth the gross sales for said lease year and the amounts deducted therefrom pursuant to Section 5.2 below. Not more than once with respect to any lease year, and then only after reasonable notice and during Tenant's office hours, Landlord shall have the right to examine or cause to be examined Tenant's records for the purpose of verifying the sales as reported by Tenant and, subject to the provisions below with respect to confidentiality, Landlord may make copies thereof, at Landlord's sole cost and expense. Tenant shall be required to preserve its records on which any statement is based for 3 years and no more. After Landlord's written request, Tenant will produce such records at Tenant's corporate headquarters, or at such other location that is mutually acceptable to Landlord and Tenant. If Landlord causes an analysis to be performed by an independent certified public accountant, and if such analysis reveals that Tenant has underpaid the percentage rent required hereunder by more than 3%, then the reasonable out-of-pocket expenses shall be paid by Tenant. Otherwise, the costs of such analysis shall be paid by Landlord. If Landlord fails to object in writing to any statement within 36 months after the statement was rendered, such statement shall be conclusively presumed to be correct. Landlord agrees to keep all information and records relating to Tenant's gross sales confidential, except that Landlord may disclose, to an extent and in a manner that is commercially reasonable, summaries of such information to prospective purchasers or lenders of Landlord's property, provided such prospective purchasers and lenders agree in advance in writing to keep such information confidential, except as required by law and except as otherwise allowed by a court in any litigation. g. Amounts received from the sale of services or contracts for services, warranties, maintenance, insurance, construction or installation and the like shall not be included in gross sales, except any portion which is paid to Tenant.